For the early part of my audiophile pilgrimage, I, like most other audiophiles my age, listened to push-pull class A/B amps. In the mid to early eighties, I discovered class A transistor amps, and then in the mid to late eighties I came upon the Beard P35, a wonderful little pure class A push-pull tube amp. 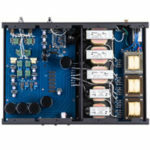 Through a doctor friend who was trying to build the ultimate Quad 63 system, I discovered the Futterman OTL amplifiers. Harvey Rosenberg himself came down to Auburn, Alabama and helped set up the system. I had never seen so many big tubes, but boy did they make the Quads sing. They were way out of my price range so I stayed with the pure class A tube amps for years until I discovered SETs. Wavac amps with Western Electric 300Bs have been my standard for a while now, but I have never forgotten how good those OTL amps sounded on the Quad 63s. So, it was with some genuine excitement that I awaited the arrival of the Atma-Sphere Music Amplifier M-60 Mk. 3.1 mono blocks. On paper, these amps should really be my cup of tea. They are completely triode-based, they operate in class A, and they use Atma-Sphere’s direct-coupled output transformer-less (OTL) output stage. OTL amplifiers, though, are even less known and understood by myself and most audiophiles than my beloved SETs. As we know, almost all other amplifiers have output transformers. For output transformers to not ruin the sound of an amp, especially a SET tube amp, they have to be wound very carefully, made of very expense metals, and thus cost a lot of money. OTL amplifiers of the seventies developed quite a reputation. The best known of these amps were the ones I mentioned above, made by the late Julius Futterman, and then by the late Harvey Rosenberg at New York Audio Labs. As good as they sounded, they had a propensity for catastrophic failures, even occasionally bursting into flames, a sight I observed one night at my friend’s house. Atma-Sphere only makes OTL amplifiers and their design is very different from the Futterman amps. Atma-Sphere has been making OTL amps for a little over 34 years. Through most of the 1980s they found it difficult to gain acceptance in the mainstream audio community. Amps of triode design were not gaining acceptance at the time, and from the very start Atma-Sphere’s amps have been triode OTLs. Add to this that many people thought all OTL amps would be unstable, and you see how Atma-Sphere got off to a rather slow start. 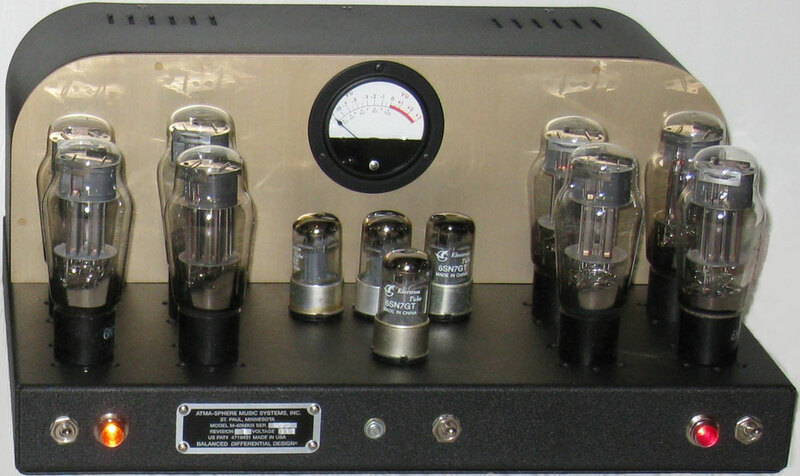 Power amplification tubes are high impedance devices. Speakers are low-impedance loads that require a lot of current to play. The most common way of getting these two to work together has been the use of output transformers. Good transformers have always cost a lot of money and are often the weakest link in a tube amplifier. While some of the really great sounding amps made now or in the past were designed by people who swear that the very best transformers are the best way to match power tubes to speakers, for all of my life there have been designer trying to build tube amps without transformers. The first I ever really knew anything about were the ones I mentioned above by Julius Futterman, who began to work on OTL amps in the 1950s. By the time I heard one of his designs he had passed away and Harvey Rosenberg of New York Audio Labs had begun to market Futterman’s amps as a real commercial product. This brings us to the Atma-Sphere M-60 Mk3.1 mono blocks I have in for review. The amps I reviewed are equipped with their most basic option plus V-Cap Teflon caps. Each M-60 measures 17″W x 8″H x 13″D, weighs 30 pounds, and uses eight 6AS7 power tubes and four 6SN7s. The output tubes bias automatically. On the front panel, you find toggle switches and indicator lights for power and standby. The Cardas RCA and XLR inputs are now on the back panel, as are the Cardas binding posts, fuses and the IEC power cable receptacle. The amps are finished in black “Wrinkletex”, resulting in a very nice, neat retro look. The Atma-Sphere amps are direct-coupled, operates in class A with triode, OTL output stages. 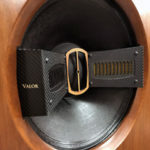 This was something completely new when they brought their first amps out, and they claim it was the first successful implementation of the “Circlotron” in modern high-end audio. It is implemented with a fully differential and balanced circuit, something not seen before. Those familiar with BAT might recognize some of these terms and design features; one of the founders of BAT was an early customer of Atma-Sphere. The amplifier is built with only a single stage of gain and no feedback, quite unusual even for an OTL, the only one of this type I know of. 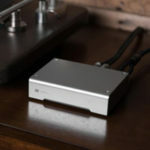 To reduce distortion without feedback is not easy, so the amplifier circuit is fully differential throughout, resulting in even-order harmonic cancellation at every stage throughout the amp. It is also all-triode and class A for best linearity. There is only a single gain stage and, of course, there is no output transformer. The monoblocks are automatic biasing and thus very user friendly. The single VU meter mounted in the center is for power and tube monitoring. The amps are fully hand-wired with no circuit boards and it uses a low-noise “star” ground circuit. THD: typically under .5% with proper setup. I am reading and enjoying some of your equipment reviews. 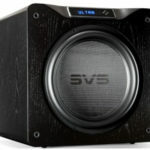 However I find myself frustrated because the review states that the amplifier gives you “great sound for the money” but fails to state the amplifier’s price! I noticed the same omission in some of the other reviews I read. This is a simple problem to address and I urge you to do so. Steve, thank you very much for your email and readership. Our apologies for the omission. As we continue our relaunch transition since Jan 1, we ask you and our readers for your help in identifying similar issues and shoot us a note. Meanwhile, enjoy the new Dagogo Experience! Enjoy the reviews. I read with interest since I have a pair of Quad ESL-2805s. There seems to be a cult following of the OTL amps with the Quads. Any thoughts on the differences between the AtmaSphere M-60 and the Leben CS-660? I was wondering why the reviewer failed to mention the only person, outside of Futterman 60 years ago, to get a government patent for his outstanding OTL amplifier design, Bruce Rosenblit at Trancendent Audio. His OTL amps are awesome, reliable, affordable, and probably there are 20 time the number of his amps in use today. But then I noticed Transendent Audio is not a “Sponsor” of this website and Atma-Sphere is. That answers all my questions. This review should be taken with that obvious omission in mind.